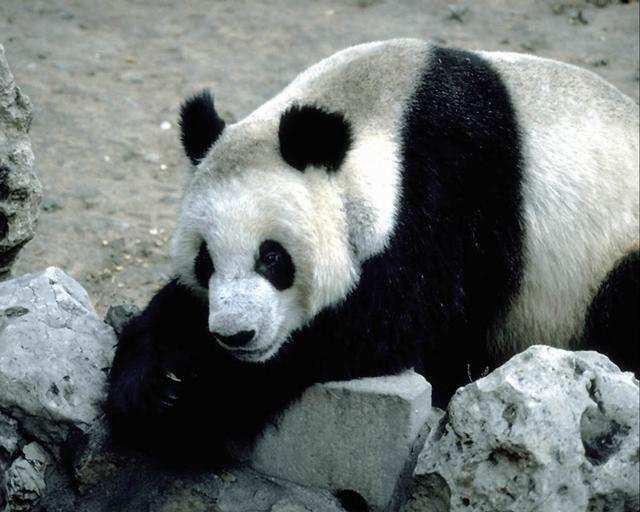 Giant pandas are found only in the mountains of central China-in small isolated areas of the north and central portions of the Sichuan Province, in the mountains bordering the southernmost part of Gansu Province, and tin the Qinling Mountains of the Shaanxi Province. Pandas are about the same size of an American black bear, giant pandas stand between two and three feet tall at the shoulder (on all four legs), and reach four to six feet long. Males are larger than females, weighing up to 250 pounds in the wild. Females rarely reach 220 pounds. Giant pandas reach breeding maturity between four and eight years of age. Female pandas ovulate only once a year, in the spring. A short period of two to three days around ovulation is the only time she is interested in mating and able to conceive. Calls and scents draw males and females to each other. Female giant pandas give birth between 95 and 160 days after mating. Although females may give birth to two young, only one usually survives. Giant panda cubs may stay with their mothers for up to three years before striking out on their own. This means a wild female, at best, can produce young only every other year; in her lifetime, she may successfully raise only five to eight cubs. The giant pandas’ naturally slow breeding rate prevents a population from recovering quickly from illegal hunting, habitat loss, and other human-related causes of mortality. Vienna, Austria - home to two pandas (a male and a female) born in Wolong, China in 2000. Chengdu Panada Breeding Research Centre, Chengdu, China - Home to Xiong Bong (M), son of YongMing and MeiMei (Japan). Chiang Mai Zoo, northern Thailand - home to Chuang Chuang (M) and Lin Hui (F). Much to the joy of the public, the two have recently been observed mating and it is hoped that cubs will be produced from the union. Ocean Park, Hong Kong - home to Jia Jia (F) and An An (M). Pandas in Japan have double names: a Japanese name and a Chinese name. Ueno Zoo, Tokyo - home of Ling Ling (M), he is the only panda with "Japanese citizenship". Adventure World, Shirahama, Wakayama - Ei Mei (M), Mei Mei (F), Rau Hin (F), Ryu Hin and Syu Hin (male twins), and Kou Hin (M). Yu Hin (M) went to China in 2004. In December 2006, twin cubs were born to Ei Mei and Mei Mei. The map labeled PREHISTORIC PANDA DISTRIBUTION shows the approximate original distribution of giant pandas. The map labeled HISTORIC PANDA DISTRIBUTION shows the approximate distribution of giant pandas during most of the last 2,000 years. It is estimated that there are somewhere around 700 and 1,600 giant pandas still alive in the wild. About 220 pandas live in zoos and breeding centers around the world, mostly in China. Bamboo is the most important plant in a giant panda's life. Pandas live in cold and rainy bamboo forests high in the mountains of western China. They spend at least 12 hours each day eating bamboo. Because bamboo is so low in nutrients, pandas eat as much as 84 pounds (38 kilograms) of it each day. Pandas grasp bamboo stalks with their five fingers and a special wristbone, then use their teeth to peel off the tough outer layers to reveal the soft inner tissue. Strong jaw bones and cheek muscles help pandas crush and chew the thick stalks with their flattened back teeth. Bamboo leaves are also on the menu, as pandas strip them off the stalks, wad them up, and swallow them. Giant pandas have also been known to eat grasses, bulbs,eggs,fish, fruits, some insects, and even rodents and carrion. 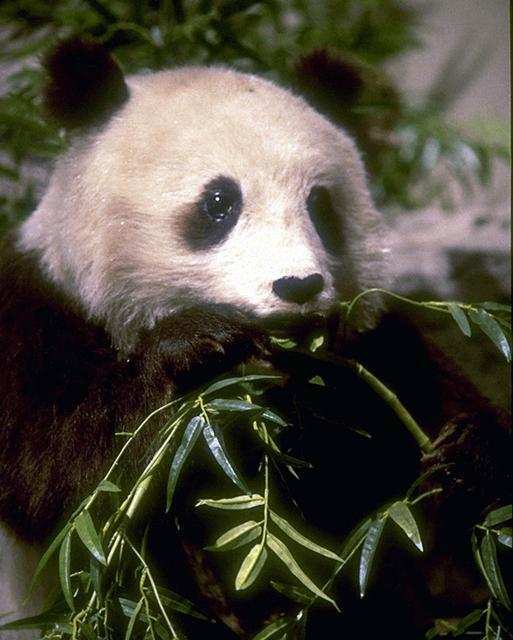 The panda's dependency on bamboo as a main food source is a problem. Each species of bamboo has a unique reproductive cycle. Some bamboos die within one to two years after flowering, while others do not die, but their vegetative growth slows. Then it can take approximately 5 to 10 years for it to regenerate to the point of being a reliable food source again. There are many different types of bamboo in China- about 300 species, but the panda will only eat about 10 to 15 different varieties. Habitat destruction— China has more than one billion people. As people build more cities and farms and use more natural resources, giant pandas lose their homes. Hunting— When hunters set snares for other animals, like musk deer, the traps often kill pandas instead. By mid-2005, the Chinese government had established over 50 panda reserves, protecting more than 10,400km² and over 45% of remaining giant panda habitat. However, habitat destruction continues to pose a threat to the many pandas living outside these areas, and poaching is a further problem. Today, only around 61% of the population, or about 980 pandas, are under protection in reserves. As China's economy continues its rapid development, it is more important than ever to ensure the giant panda's survival.